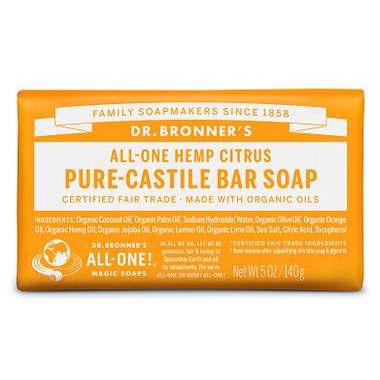 Dr. Bronner's Pure Castile Bar Soap features citrus oil which is stimulating for the skin and peps up the spirit. All oils and essential oils are certified organic to the National Organic Standards Program. My favourite soap! The smell is nice and gentle, and it lasts so much longer than other bars of soap. Affordable too! Love it. Using it for homemade laundry soap. Easy to grate, dissolves easily and smells fantastic. No more itchy skin from commercial detergent!! 1 bar grated castile soap. 15 drops citrus essential oil. 15 drops peppermint essential oil. Great soap. Gentle and has a very subtle citrus smell. My only complaint is that I wish it would last longer. The soap smells great. I used it to make my laundry detergent. Dr. Bronner's is the best! It's been a longtime favourite of mine. It is very gentle on the skin and lathers nicely. I think I've tried most of the scents, and this is one of my favourites, it's very fresh-smelling! Nice soap, doesn't get 'slimy' like some other natural bar soaps do. Even my husband likes it and he typically doesn't like natural soaps. Really like this soap. Smells great, lasts a long time and no toxic ingredients. Love this soap! I use it to make laundry detergent and it turns out great and smells delicious! The citrus smell is a little strong, but a nice soap overall. Next time I would bye the unscented version. I was very happy when I opened the bar, it smelled great! However once I got out of the shower my wife said that it left my skin with a sweet & sour smell which she didn't like. It leaves your skin with a two tone scent, one part citrus smell (sweet) and the other from one of the soap's core elements (sour) and they don't blend well. In the end I was very disappointed and I probably won't try any other of their pricey products. Love this soap. Beautiful scent, leaves my skin feeling SOFT and soothed. Love all their products. Love all the Dr. Bronner's soaps because they are vegan, last a long time and this citrus orange one smells particularly delicious. I just love Dr Bronner's soaps! This Five-generational soap maker has the best selling soap in the world for a reason! I'm over 55 years old and live in dry,dry Alberta and this soap is absolutely fabulous for my skin. It may seem a little pricey, but a bar lasts 15 times longer than 'ordinary' soap. You can use it as a shampoo (it rinses clean) so it's a perfect travel soap. Organic essential oils, first class ingredients, fair trade â€¦ Love this soap! Smells great and great for making homemade laundry soap. Pleasant and not overpowering. The soap suds up nicely, but I expected the scent to be a little stronger. I have been using this brand of soap for a while, first time I tried this scent. Love it, however like all their bar soaps, the smell does not last, after a few days you can hardly tell the bas was scented. However, I keep using these products because they are great for my sensitive skin, lather well and leave no film once rinsed. Usually I make my own soap or buy soaps from a company in BC. I decided to try this soap to see if I liked it as well as my normal stuff and be able to save on shipping. I found the scent to be pleasant but almost non-existent. I tried it 3 showers in a row and didn't like how it made my skin feel so dry. I pitched it and will continue to either make my own or buy from my regular source. Lovely soap! The scent is light and fresh. Leaves my skin feeling squeaky clean, but not stripped. I do love the Dr. Bronners liquid soap. My favorite is the Tea Tree oil that comes in a bottle. I decided to buy the bar to see what it is like and if it is the same. I have to say that this bar does suds up well but a little disappointed when it comes to the scent. The smell wasn't that strong to me like how it smells in the bottle. It only has a very slight smell of the orange. It cleans well that is for sure. I will not purchase the bar again but will purchase the ones that comes in the bottle. Lovely soap with a fresh scent. One of the better bar soaps I've tried. Lovely scent! I bought this to make my own laundry soap, which works amazing, but I have also used this just as hand soap before, also amazing though a bit expensive. I use this to make my own laundry detergent. Great stuff, smells wonderful. divine smelling. long lasting. feels great w no residue. winner! Great product, I love all of dr. bronner's soaps. I make my own laundry detergent. This is the soap i choose to use in it and couldnt be happier. Has a nice fresh scent, not over powering at all. Works great, but we still use the baby unscented on our skin. Sensitive family and we love dr. Bronners! Everyone here leaving great reviews is the reason I bought this soap! And guess what? I LOVE it too! Clean and fresh smelling, and the scent is light as some said here. It leaves my skin feeling really clean, yet soft and moisturized. The bar is lasting and will last a very long time. I am going to buy this soap from now on. Very happy! Love this soap. Great yet light smell with gentle yet effective cleaning power. Feel great on your skin and I have been using it as a face soap. I have oil/combination skin type and this soap has done wonder for me. Love it !! I love Dr.Bronner's soap but the scent of this one is not as intense as other one. I was pleasantly surprised about everything to do with this soap: the smell is great, it lathers nicely, and it feels clean (no residue). I will definitely get this soap again! I love the citrus smell, clean, simple, very interesting philosophy - Dr. Bronner, reading about him makes you glad you bought the soap. Very nice, "smooth" soap and it smells lovely! Great soap. I have very dry skin, this soap leaves it very soft and smooth. Love it!! Love it. Fabulous lathering and the smell is nice yet not overpowering. The soap stays hard and lasts a long time too. I highly recommend it. I really like the scent of this soap, juicy citrus that is not overpowering. I use it in my homemade powder laundry soap (along with washing soda and borax) and enjoy the fresh scent. Dr. Bronner's makes very good products. Easy for the kids and parents to use as a body bar and/or shampoo. Smell is wonderful. Fabulous soap - great lather - you want to keep washing your body with it - hard to get out of the shower. Lasts well as it feels really hard and does not go slimey - good to the last tiny little bit - still soapy. Rather sad when the last tiny little piece goes down the drain! Oh well time for another bar - which scent shall I use this time - they are all so great - natural but not overwhelming! As mentioned, the scent isn't as strong as other Bronner's bars, but it lasts a long time. Great soap - loved the mild scent.